Manufactured in Chine from Circa 2000 until 0. This small US camera manufactured in China is made of silver colour plastic with matte soft gray finger rest and a green area around the lens. It is well in hand and meets the specifications IX240. It uses the 3 CHP formats through masking: C for Classic, 16/9 (H) and panoramic (P). The MRC mention reports that the film can be removed during its exposure (all APS devices will not allow it) and the position is then memorized. The C750 functioning is started by lifting the transparent flap (hey! A flap when there is no bellows) serving also as a lens cover. But smart feature, this cover has a third function: it includes a flash unit, admittedly tiny, but which is placed on a so small camera a good eight centimeters above the lens (the camera, when closed, is 6.3 cm high). 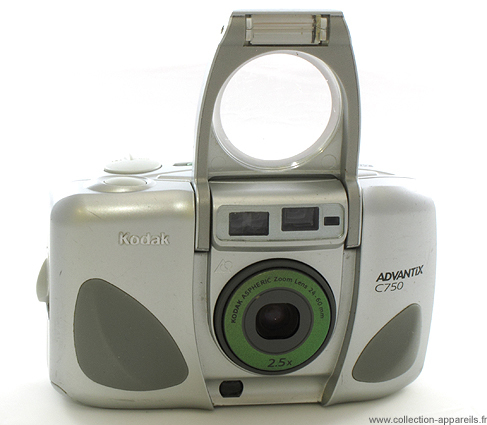 The unused camera, even with the flap open, switches off after 2 minutes 30 to save on the battery. With an aspherical element, the lens pretends to a certain quality. The zoom range (2.5x) begins at wide angle end (approx. 30 mm equivalent). The flash can be automatic, off or used forced against backlighting. Program also allows the focusing forced to infinity; a portrait mode that automates the zoom for a single shot; a night mode; and a spot measurement of the distance. It is essentially by some details that the models C750 and T700 may be distinguished. For example, the C750 presented here has a passive focusing system with triple reading on 140 zones, while the T700 has a quick, active focusing system with single reading on 190 zones. The C750 is equipped with a lens with an aspherical element, but unnamed, while the T700 has received a Kodak Ektanar about which we only know that the lens is glass.